New Zealand’s most consistent surf break and a café lined promenade to watch all the action. There is nothing between this white sandy beach and the Antarctic. It has New Zealand’s most consistent surf break and a café lined promenade to watch all the action. If you have never tried surfing, St Clair is the perfect place to give it a go with the Esplanade Surf School right there to help you out. However, the surf is not the only thing that is attracting lots of people to St Clair. The area has gained its ‘second wind’ - it's the place to be seen in Dunedin and is continuing to grow as a must visit place. 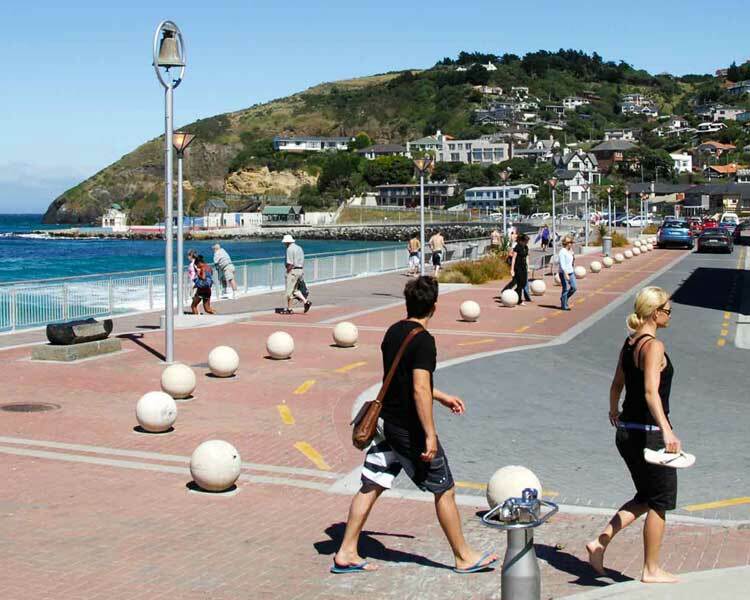 Cafes and bars line the esplanade, a breath-taking view of the Southern Ocean; surfers enjoying the waves and a newly remodelled playground complete the vista. These restaurants and bars cater for every occasion from a quiet morning coffee while you gaze to the horizon, to a lively night out in a fantastic seaside setting. Swell Café is a great spot to sit outside and watch for those who forgot their wetsuit and board. The history of St Clair is far reaching, in fact the building of St Clair’s latest development, St Clair Beach Resort a 4.5 star resort, which opened in 2009, was halted early in the development stages to excavate a Maori site – yes visitors have been coming to the area for a very long time! The much photographed wooden posts on beach are the remains of an old breakwater. The beach is also the site of the city's annual "midwinter plunge", which sees residents brave the chilly waters every year at the winter solstice. St Clair and St Kilda Beach are great for surfing and chilling in the sun. The Dinosaur Playground at Marlow Park in St Kilda is hugely popular. At the southern end of St Clair Beach, under the shadow of Forbury Hill, lies the St Clair Hot Salt Water Pool, an open-air public swimming pool nestled within rocks just metres from the ocean. The Salt Water Pool was opened in 1884 and heating was added in the 60s. It’s a spectacular spot with waves crashing onto the boulders below and surfers catching the breaks in the background. It's particularly suited for people who love swimming in salt water, but don't want to endeavour the cooler sea waters. Read about up to date hours and pricing information. &amp;amp;amp;amp;amp;amp;amp;amp;amp;amp;amp;amp;amp;amp;amp;amp;amp;amp;amp;amp;amp;amp;amp;amp;amp;amp;amp;amp;amp;amp;amp;amp;amp;lt;script&amp;amp;amp;amp;amp;amp;amp;amp;amp;amp;amp;amp;amp;amp;amp;amp;amp;amp;amp;amp;amp;amp;amp;amp;amp;amp;amp;amp;amp;amp;amp;amp;amp;gt; // Disable drag and zoom handlers. map.dragging.disable(); map.touchZoom.disable(); map.doubleClickZoom.disable(); map.scrollWheelZoom.disable(); // Disable tap handler, if present. if (map.tap) map.tap.disable(); &amp;amp;amp;amp;amp;amp;amp;amp;amp;amp;amp;amp;amp;amp;amp;amp;amp;amp;amp;amp;amp;amp;amp;amp;amp;amp;amp;amp;amp;amp;amp;amp;amp;lt;/script&amp;amp;amp;amp;amp;amp;amp;amp;amp;amp;amp;amp;amp;amp;amp;amp;amp;amp;amp;amp;amp;amp;amp;amp;amp;amp;amp;amp;amp;amp;amp;amp;amp;gt; View St Clair & St Kilda in a larger map.